In a savage attack of community spirit, Miss Pink and I have flouted the fine print on the Local Council’s OH & S charter and erected two rope swings in our local park. To hell with the rules: there’s that big old fig and all its thick curling boughs, just begging for action. So we did it; recycling timber from the side of my shed and some rope I used for our IKEA Hack porch swing. Pinkster was my pilot, helping me position both swings for little legs to reach the ground. They’re very simple, one a traditional swing with rope attached at each end of the seat (and I do use that term loosely) and the second for bigger more adventurous kids/ adults/ drunkards. A single plank with one rope attached through the centre, for some serious out-of-control- in- all-directions swinging! So each day since, playdates or solo, has ended at this lovely park. And so far the council sphincter police have not removed our swings. 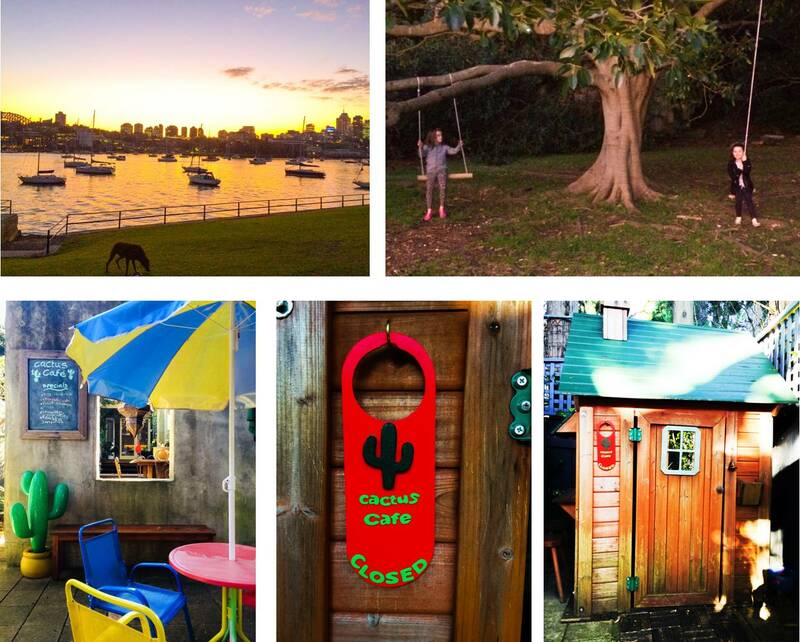 Our other big project this week was the renovation of the cubby house, which is now Cactus Café and Organic Grocer. Pinkster and her friends have always been keen food servers, so after I found a blow up cactus on the roadside during a council clear up, we renamed and renovated. Adding shelves inside, an outdoor grocery stand, and long timber bench (also curb-side finds). I bought an outdoor setting from Aldi and IKEA sold us our DUKTIG cash register. I cut a cardboard template and cut out two cacti from craft wood, shaped these with an emery board before paining. Then I glued these to a make-your-own doorknob sign from the hardware store. I didn’t trust my hand writing using a paintbrush but fortunately we found some foam letter stickers in a craft shop in the perfect colour. So between our renovated café and our park swings we’ve kept busy, had a lot of fun and so have Pinkster’s friends. I think we should start a community spirited movement: Random Acts of Swinging where everyone who can, puts up a swing in their local park for the kids to use. I think I will make a chalk board! Leaving over night between coats obviously. I have a load of frames I picked up at council clear up that need to be used for something. I'll give you a can of my overnight chalkboard paint - we're both of us too impatient to watch paint dry!